Tompot blenny power! How to deal with a velvet swimming crab. This pesky velvet swimming crab keeps creeping into my crevice home when I’m out searching for food. He doesn’t seem to get the message that he isn’t welcome, so I have to deal with him every time I get home. It takes a full blown head on barge, followed by careful manoeuvring to avoid his sharp claws. I then back in beside him and forcibly shove him sideways out of my crevice. As you can see from the video, I’ve nearly succeeded. It’s an uneasy truce for now but I’ll have another bash later! I use a different technique to shift edible crabs from my territory, please take a look at my blog of 19th June 2015. Author Benny the blennyPosted on 23rd January 2017 Categories Animal behaviour, Animal physiology, children's book, combtooth blenny, Crustacea, Edible crab, fish, Territorial fight, Tompot blenny, Underwater photography, Velvet swimming crabTags beach, blenny, crab, fish, nature, shallow water, tompot blenny, underwater, Wembury, wildlifeLeave a comment on Tompot blenny power! How to deal with a velvet swimming crab. Our first big winter storm (called ‘Angus’) would have sent the cuttlefish jetting off to deeper water, thank goodness. The sea has calmed again since then, so Teresa and Paul decided to shore dive and swim out to my reef to see how we are all getting on. They were pleased that, even though it’s looking wintry (some of the big seaweeds have been stripped from the rocks by the power of the waves from the recent storm), there was a tranquil scene. Around my crevice, there was a spiny starfish and several painted top-shells (beautiful pink and cream sea snails) creeping over the vertical rock face; it’s a shame they are just too big for me to eat! Red-eyed velvet swimming crabs, and common prawns with their blue and yellow legs, were tucked into gaps between the rocky ledges. A conger eel and two lobsters were lurking in the deeper, larger crevices. Ballan wrasse were gliding around the thongweed on top of the reef. Amazingly, the fearless new young tompot blennies were showing off among the rocks; they settled this autumn and are growing fast. The one in the video is now about 4 cm long and, as you can see, is a cool tough dude. That’s my babe, it definitely has attitude! 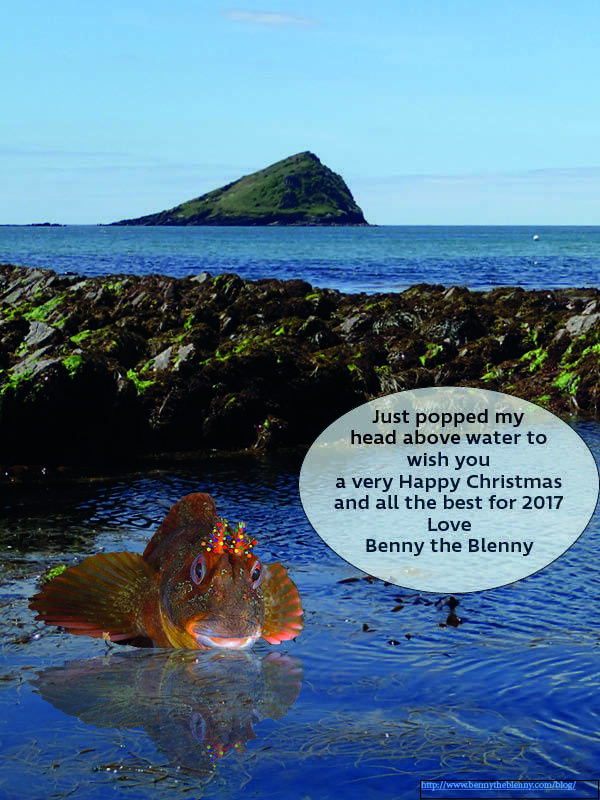 Author Benny the blennyPosted on 8th December 2016 Categories fishTags beach, blenny, fish, fish larvae, head tentacles, marine week, plankton, sea, shallow water, tompot blenny, UK, underwater, Wembury, wildlife1 Comment on Young tompot with attitude! Talking of marauding predators, I watched this cuttlefish cautiously from the safety of my crevice home. It grabbed a small fish with its long tentacles and I wondered who had been the unlucky victim. Before the cuttlefish jetted away, I saw a sea scorpion’s tail sticking out from its tentacles. That fish’s camouflage hadn’t deceived the superb vision of the cuttlefish this time, with fatal consequences! 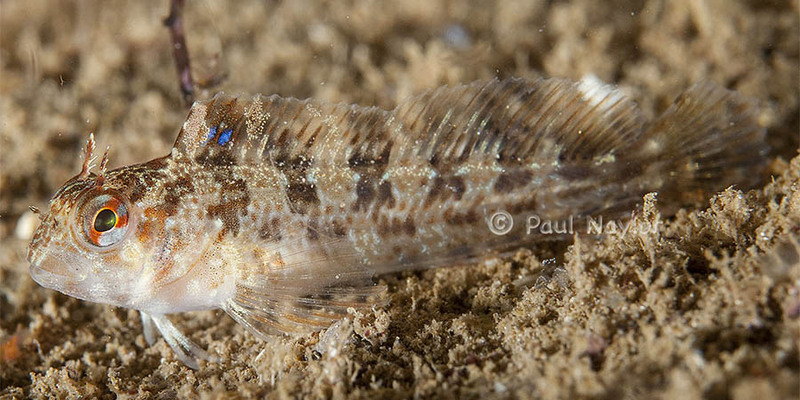 Sad to see I guess, but cuttlefish have to eat and better a sea scorpion than a tompot blenny, especially as sea scorpions can eat young tompot blennies too. “Mini me” tompot blennies out and about on my reef! 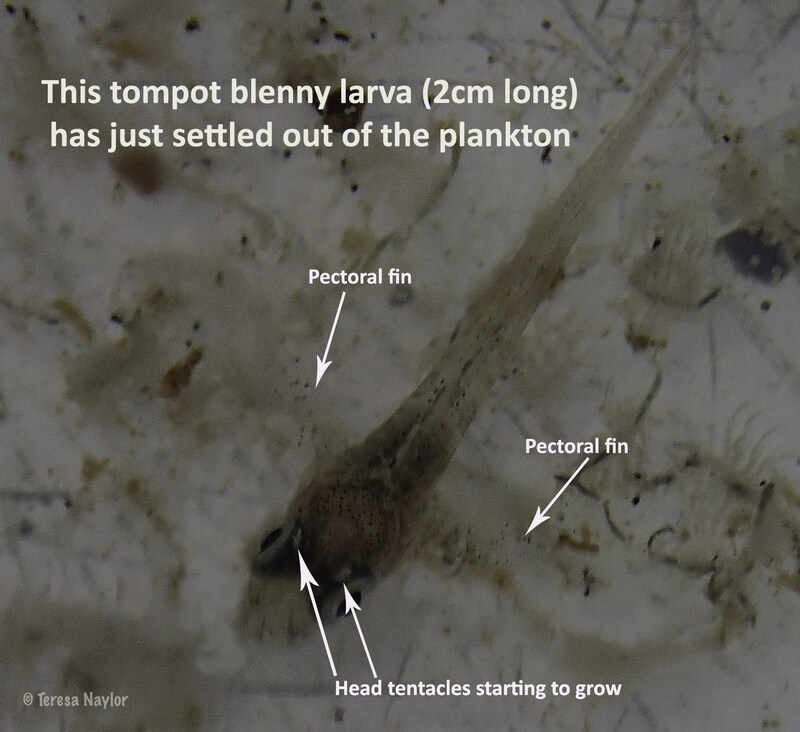 Since the baby tompot blennies have settled out of the plankton, three noticeable things have happened. First, they have taken on camouflage colours and now match up with their background quite well. Next, they have a bright blue ‘eye’ spot on the front of their dorsal fin which they can flick up; does it make them look bigger and scare away other fish? Lastly, their head tentacles are developing well and they look like ‘mini me’ tompots as they explore my reef. 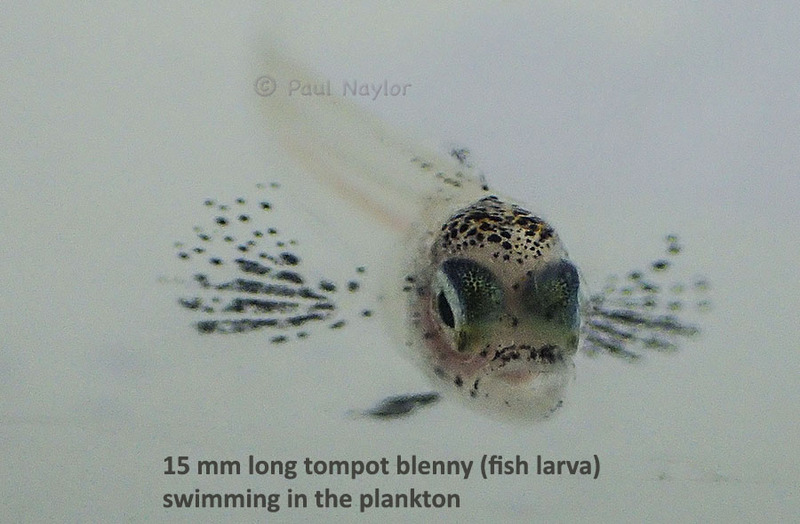 Mini me, 30mm long baby tompot blenny! They are only 20 – 45mm long at this time of the year (depending on whether they hatched from their eggs early or late in the summer) but they are just large enough to be spotted and photographed by Paul and Teresa. What always surprises them is how these youngsters are very bold and like to show off in front of the camera! Wouldn’t you expect little fish like these to be much more timid and hide in the small crevices away from marauding predators? 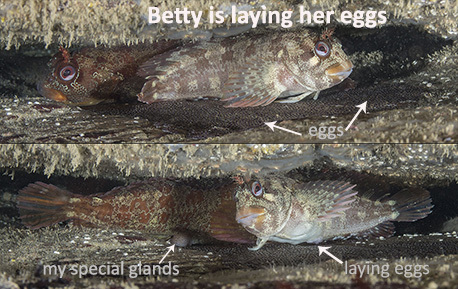 Take a look at my blog from last year 30th September 2015 http://www.bennytheblenny.com/blog/?m=201509 to see a video of two very small tompot blennies play fighting. Author Benny the blennyPosted on 23rd October 2016 Categories Animal behaviour, Animal physiology, children's book, combtooth blenny, fish, head and nostril tentacles, plankton, Territorial fight, Tompot blenny, Underwater photographyTags head tentacles, plankton, shallow water, territory, tompot blenny, UK, underwater, Wembury, wildlife1 Comment on “Mini me” tompot blennies out and about on my reef! Nosy fish – keeping watch. The eyes have it! I’m keeping watch for predators and intruders. You can see from this video that I have unusual eyes and can look in different directions at the same time. I’ve spotted something interesting. I’m off! Author Benny the blennyPosted on 8th July 2016 Categories Animal behaviour, Animal physiology, children's book, combtooth blenny, fish, Tompot blenny, Underwater photographyTags blenny, head tentacles, marine week, nature, sea, shallow water, snorkelling, tompot blenny, UK, underwater, Wembury, wildlifeLeave a comment on Nosy fish – keeping watch. The eyes have it!